I skipped to the end of the word for this month's cube. The reason being it would count as the ornie for the Hallowe'en Ornie blog featuring a tombstone - a twoferone is always good. Not one, but THREE Crowjackers by Just Nan. 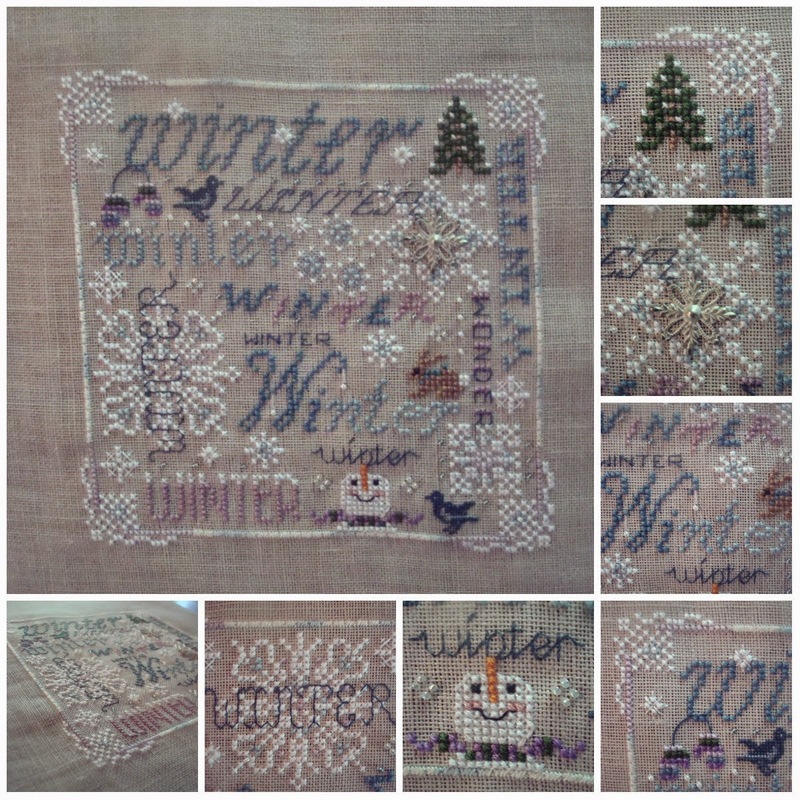 I stitched them on the same 32 count lavender evenweave I used for the Moonriders last year. The plan is to make them all into ornies for this Hallowe'en. I wonder if that plan will come to fruition? Isabella from Primitive Hare, another Italian designer. I do seem drawn to the Italians this year! 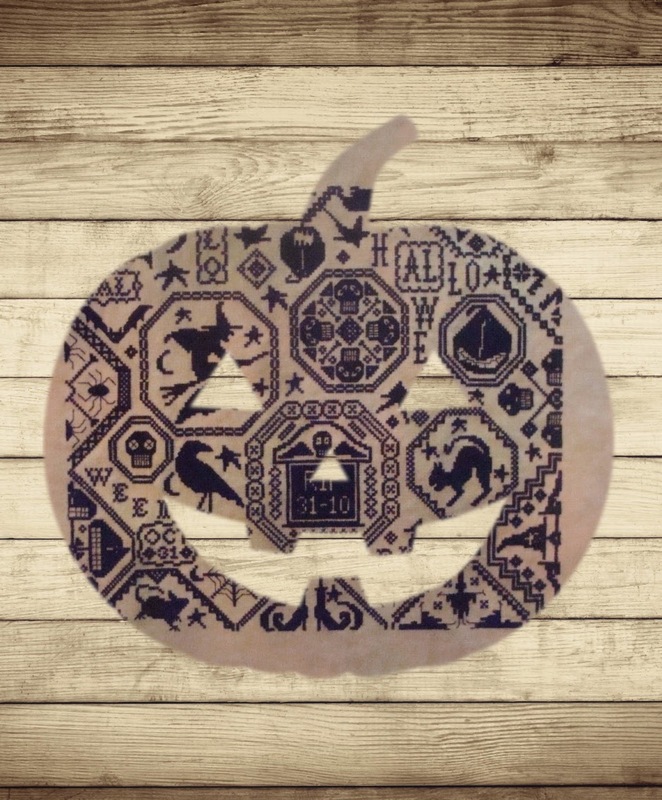 You can see more photos of the entire design on my post Spooky Countdown. They are all stitched on the same Vintage Grain linen, it's just the light when I photographed them! Yes! 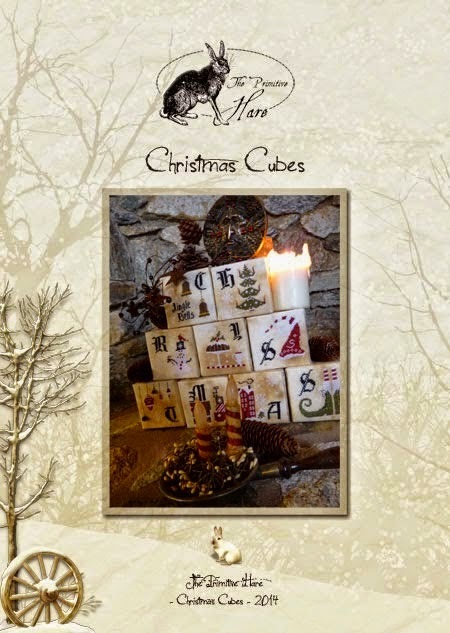 I have the Christmas Cubes in my stash and also Dear Santa. 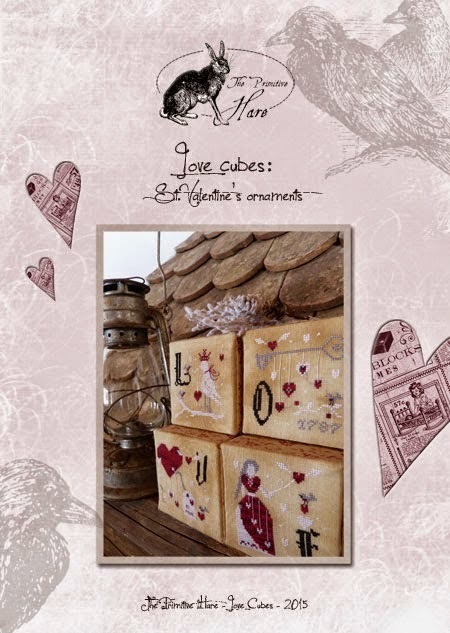 When I have stitched both sets of cubes I will treat myself to the Love Cubes too. Isabella does some lovely freebies on her blog. 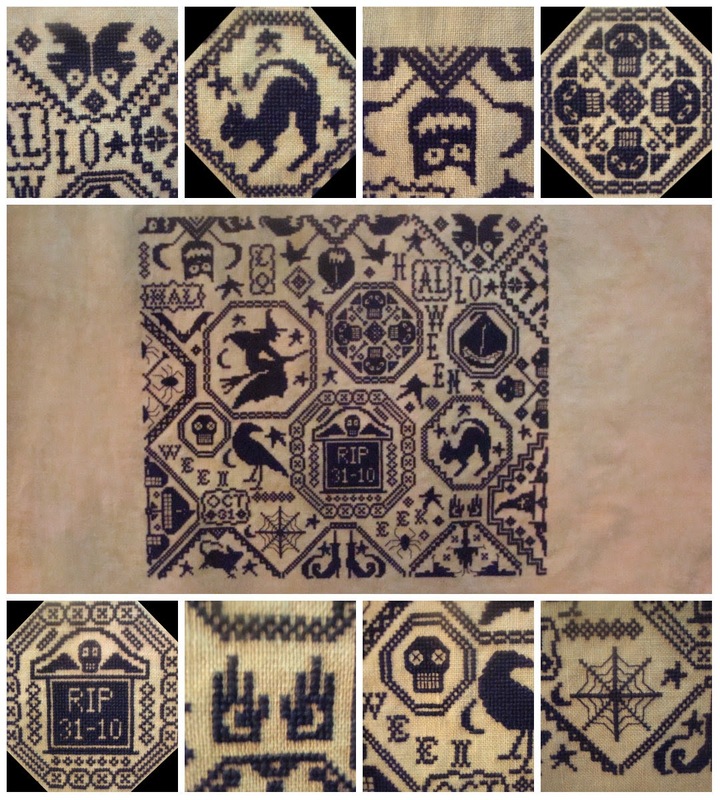 There is a set of eight based on the Pagan Festivals which I'd like to stitch. 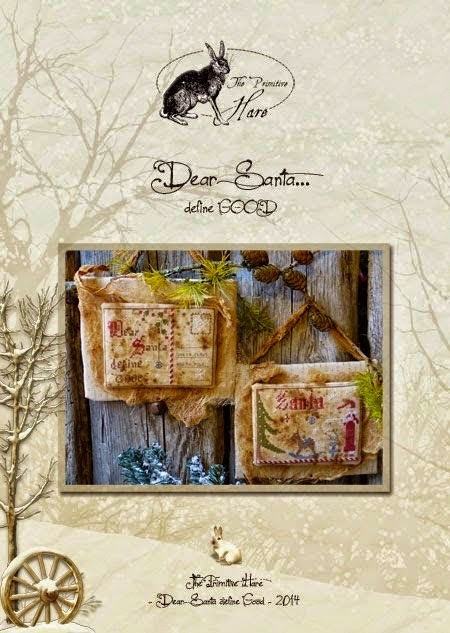 She also has two monthly SAL running at the moment - a Hallowe'en one and a Christmas one. Strangely, I am more drawn to the Christmas one because it focuses on the traditional 12 Days of Christmas as celebrated in Europe (rather than the Partridge in a Pear Tree rhyme). Stitch from Stash restrictions mean I will have to wait until my Birthday for that one though! The subject matter is definitely a big attraction for me. I love Hallowe'en (as you already know!) and I love the old traditions. In particular I like the way the early Christians used these traditions to help spread the religion without alienating the populace. In the 21st Century it is so interesting to see how we celebrate festivals with a mixture of the ancient and modern traditions, Pagan and Christian ideas joined together along with features from other cultures. The current craze for Mindfulness is a good example of this. It may seem like a Buddhist idea but it is also a key point in Pagan and Christian rituals. I am fascinated by labyrinths and how they are used for meditation. The most ancient labyrinths are thousands of years old but can also be found in many cathedrals (including my closest in Norwich). Here is an interesting link on How to Meditate in a Labyrinth if you want to find out more. Isabella has a wide range of designs from Hallowe'en to Christmas, Fairy Tales to Classic Literature via Folklore and Traditions. She uses predominantly blacks and greys with a splash of bright red or white. While her Literature series is quite mainstream, her Fairytales are definitely not. I love the way they show the darker side of the stories. 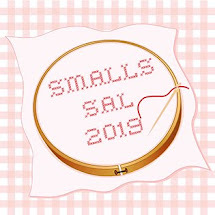 She also has her own fabric, 30 count Salem Linen available from her Etsy shop. This is a very distressed and aged fabric perfect for her primitive style designs. 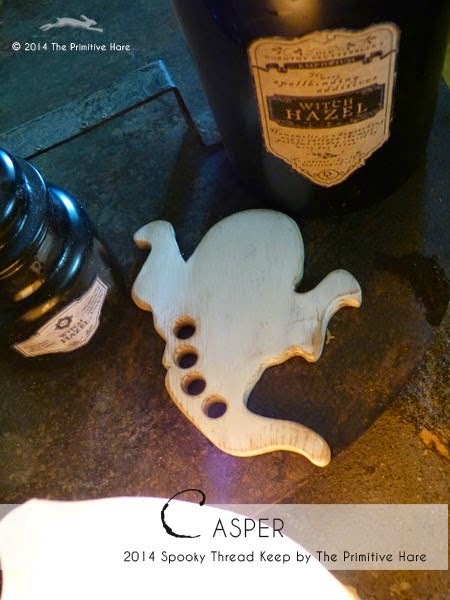 Then there are her thread keepers, solid wooden shapes (my witch is a good 7mm thick) with holes for you to tie your thread through. And the Hornbooks! I have this Ghost as well as the Witch! 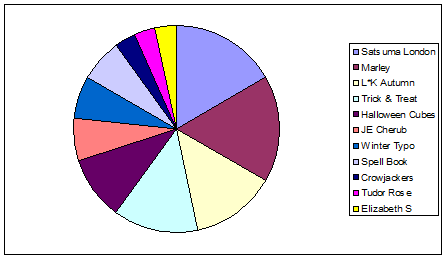 Finally, here is my monthly Pie Chart, my time was spread more equally across several designs this month. Well, if one finish in a week is a Happy Dance, then two must form the start of a Conga? Regular followers may remember Awesome Autumn Typography from 2013 where I changed one of the Autumns into Awesome. I have done a similar thing on Winter. Can you spot it? It was a very serendipitous finish too, just as SewandSo are having a 10% off sale, so of course I had to buy the next one in the series - Spring Typography. 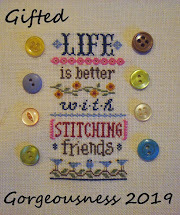 I will hold off getting Summer until I have stitched Spring. There's an incentive for me! 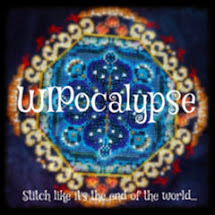 As well as treating myself to Spring Typography this month, I purchased an app for my iPad called X-Stitch App by PerformTec Ltd for only £2.29. 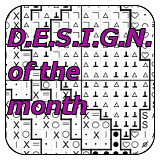 They are a husband and wife team who have created this inventory app for cross stitchers. There are three main sections; the Journal, The Inventory and the Shopping List. Each area is accessible from every part of the app so you jump from one to another easily. You can also access the app from multiple devices. The shopping list is just a notepad where you can details of anything you want or need. Because the app can be viewed even when you do not have an internet connection this would be useful when you are out shopping. The inventory is sub-divided into Charts & Kits, Threads and Linens. Under Linens they have included all the major linen manufacturers and hand-dyers as well as some smaller companies. There is also a Miscellaneous category for random pieces, or those you dyed yourself. You select the thread count and the cut size too. 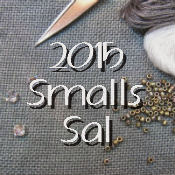 The Threads section also features all the major thread brands and many smaller businesses too. Here the colours and numbers are preloaded so all you have to do is indicate how many skeins you own of each thread. My only complaint about this section is that the numbered threads (such as DMC) are displayed in alphabetical order and not numerical order. eg 3011 comes after 301 and is followed by 3012-3033 then 304 then all the 3041 threads. This is annoying and could be easily fixed by the programmer putting a zero in front of the hundred numbers, ie 0304 not 304. You can request dyers to be added to the list under the Settings options. The Charts and Kits section is amazing!! Every designer I have ever heard of is there and many I have not. Resisting the urge to Google. You just select the designer and add the name of the project plus some free form details of linen, threads. The designers are displayed by alphabetical order on the index screen, you click on one and it shows the designs you own by that designer, along with the first line of text which is useful. There is also an option to view all your charts in alphabetical order. One thing I liked was that they have included a number of magazines, just the US ones at the moment plus Cross Stitcher. However, there is a field under Settings where you can recommend designers and I have asked for the other major UK mags to be added. I love the idea of adding the designs from a particular issue into your inventory, very thoughtful. The Journal section is subdivided into Wish-List, Kitted, Started, Finished and All. A nice feature is that once a chart is in the Inventory you can do a one click to add it to the Journal and all the information is migrated across. Unfortunately the two entries are not synced after that so any changes on one are not copied over. Minor niggle though. 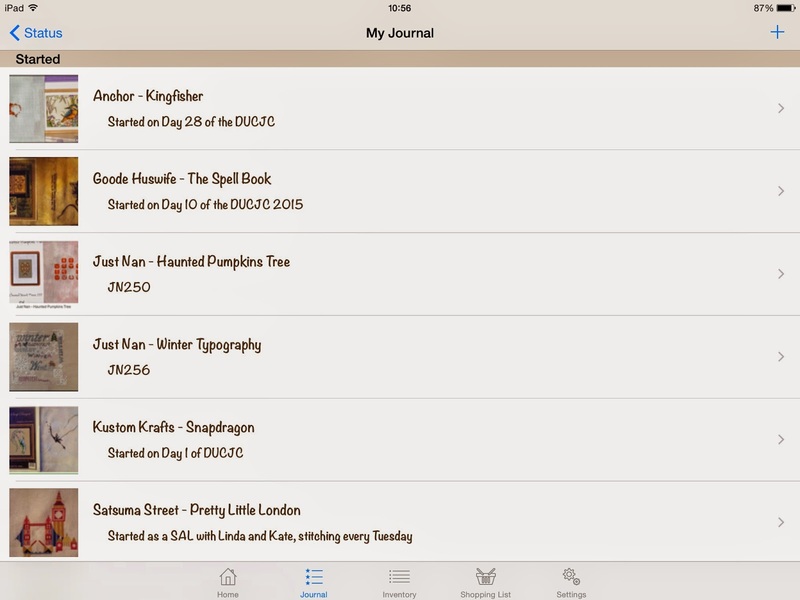 In the Journal you can add photos from your iPad really easily. You can screenshot from the internet and then add the photos too. You choose a Status and then all the designs under that status are listed in alphabetical order by project name. I found it more useful to add the designer's name at the front of the title so they are grouped together. You get a nice little picture of the current photo next to each one which can be easily updated each time to make some progress on it. Once you finish a project you fill in the date and change the Status to Finished and it automatically changes section. So, is it worth it? I have to say - Yes, it is. 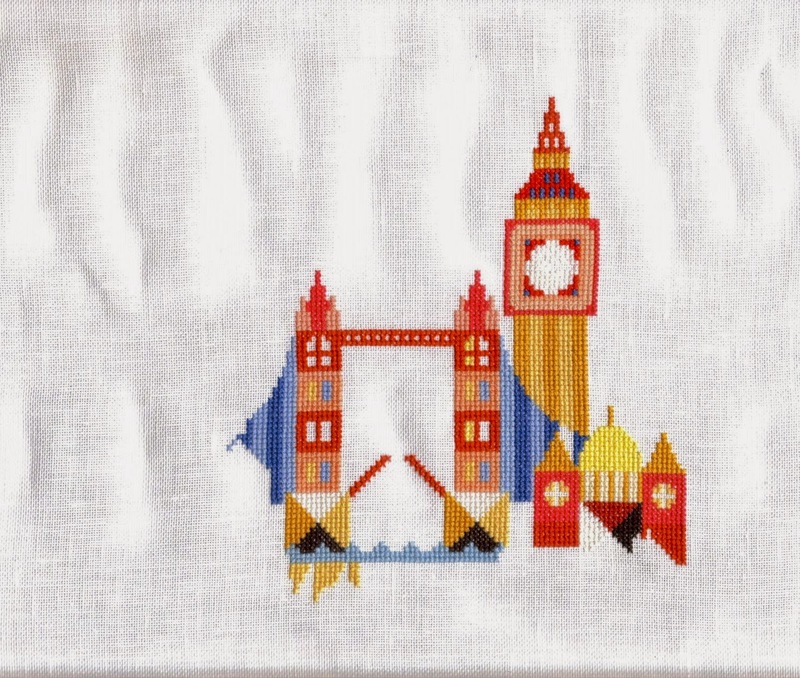 It's a nice little app designed by people who actually know about cross stitching. It's been very well thought out and is so easy to use. There aren't many instructions but there is a FAQ page and you can contact them via email. I sent an email with a couple of suggestions and got a reply despite them being on their holidays! I guess self-employed people are never really on holiday. 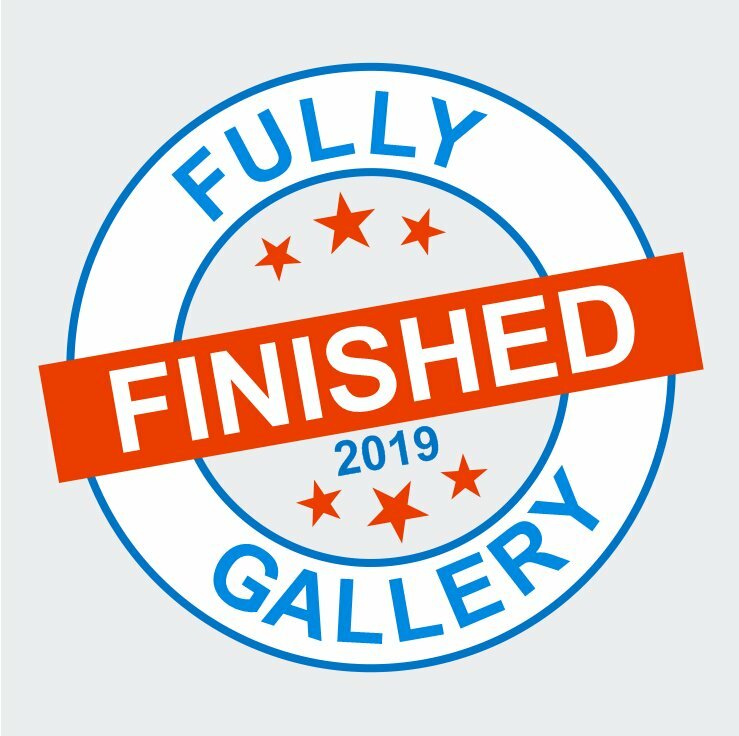 Finally, there is a new blog on the block. This one is for fans of Teresa Wentzler's intricate and gorgeous artwork. The Magnificent Teresa Wentzler SAL. Why not pop over and join in or just ogle the lovelies as they are added? Sneaky Peaky of Happy Dance! And then nothing until December 2014 when I decided to focus on this project, stitching a minimum of one length of thread per evening. This method works so well for monochrome samplers. With my cone of DMC! The fabric is a 40count hand dyed linen which was a gift from my friend Karen so I don't know who the dyer is. The colour in the progress photos is more true to life than the finished photos. I stitched using two strand of DMC 310 over 2 threads so the coverage is lovely and thick. It made the fractional stitches a little lumpy so on some motifs I missed them out and on others I stitched them with one strand. My favourite motifs were the cat and the witch. 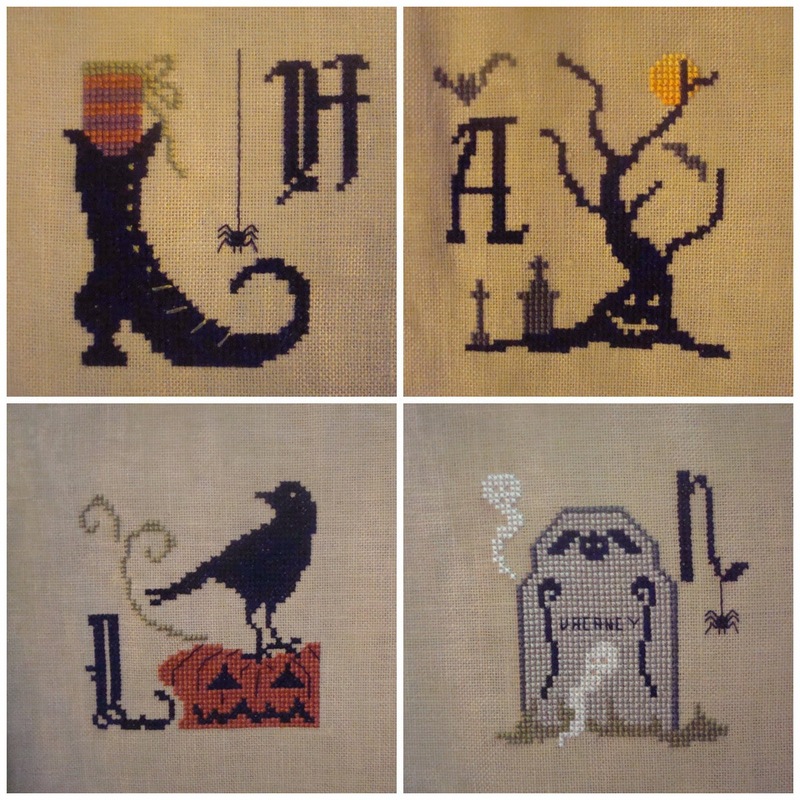 I intend to stitch them again and make them into ornies for Hallowe'en. This week I have been stitching different things almost every day. On Monday I finished another project from my 15 in '15 - Joan Elliott's Cherub from the 2013 Diary. Tuesday was Satsuma Street day. 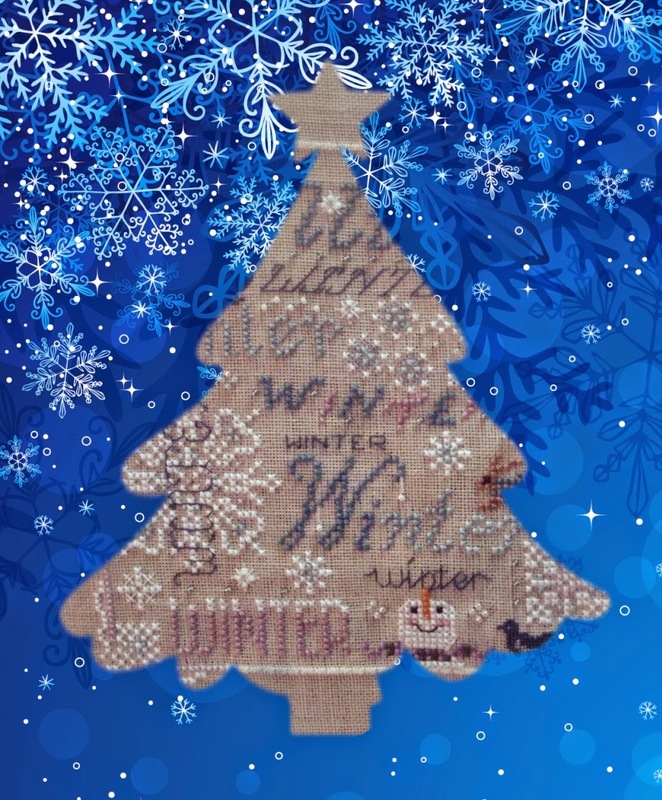 On Wednesday I went on a train journey so took Trick and Treat because it's all one colour, on Thursday I picked up Just Nan Winter Typography and Friday saw another finish for a DUCJC project - Sweetheart Tree's Tudor Rose. Today is Saturday and a work day so no stitching so far! Way back in December 2012 World Of Cross Stitching magazine had their most popular cover gift ever, a diary featuring 12 Joan Elliott designs. I intended to stitch one a month that year. Then I revised that to exclude three of the more cutesy designs then I revised it again and actually managed three finishes and one start! February was started in February 2013 and was in last year's 14 in '14 (unsucessfully) and now in 15 in '15. As ever, the crazy thing is that it only needed three days stitching to complete it. Two were pretty full-on days though, we're talking four or five hours a day. I need some more gold heart stickers, I only had silver. I used the recommended colours except for the heart because they were too pink. I also left off the border of backstitched hearts. That saved a couple of hours! This week I stitched more of St Paul's Cathedral. I substituted plain DMCfor the border and used DMC throughout. The beads and charm were supplied with the chart. I had stitched the centre last (as instructed) and noticed that it was quite raised where the eyelets had pulled the fabric so decided to make a stuffed ornie. The chart was a gift from Vickie and will now be travelling on to Gillie as a prize for leaving my 7000th comment a while back. I gave her first choice before I chose the Giveaway charts and she picked this one. Finally, the Giveaway of the other seven charts is continuing. To be in with a chance, just leave a comment on my Blogaversary post. Anyone who links up for the Gifted Gorgeousness SAL gets an extra chance. You don't have to do anything to claim that, if you have commented and linked up then my spreadsheet will automatically put your name in twice.